Researchers: W. D. Barnhart, The University of Iowa; J. R. Murray, J. L. Svarc and B. A. Brooks, U.S. Geological Survey Earthquake Science Center; S.-H. Yun and E. J. Fielding, Jet Propulsion Laboratory; S. V. Samsonov, Natural Resources Canada; and P. Milillo, California Institute of Technology. GPS data combined with Interferometric Synthetic Aperture Radar (InSAR) images characterize the fault and slip distribution for the 24 August 2014 M 6.0 South Napa earthquake. The combined geodetic data show the rupture depth decreased towards the north from a depth of about 10 kilometers to the surface near Napa. These results show the utility of geodetic data for rapid earthquake response, especially in areas where teleseismic data may not constrain the complexities of damaging events. The San Francisco Bay Area is noted for seismic activity associated with a major plate boundary between the Pacific and North American plates running through the region. Major faults demarcate the plate boundary, such as the San Andreas and Hayward Faults. Between these large strike-slip systems lies the smaller West Napa strike slip fault. On 24 August 2014 a magnitude 6.0 earthquake shook Napa and the surrounding area near the mapped trace of the West Napa fault. The West Napa fault recorded a magnitude 5 earthquake in 2000, which is the only other historically recorded event on the fault. Nearby faults, such as the Rodger’s Creek and the Green Valley faults are projected to have greater earthquake potential, but did not break as part of the 2014 event. Sorting out the location, direction and amount of slip caused by the earthquake will help to understand how and why earthquakes start and how the event affects the level of stress on the various faults in the region. The area is well monitored with geodetic tools, especially UNAVCO’s Plate Boundary Observatory, a dense network of GPS/GNSS sites, and repeated satellite-based radar images. The radar images are differenced to create interferograms showing changes in the surface during and after the earthquake. Here the authors combine the geodetic data to determine the earthquake mechanism and the slip distribution along the fault with the goal of being able to apply similar techniques for rapid operational earthquake response worldwide. Together the geodetic data leads to a well-resolved description of the earthquake mechanism and the slip distribution along the fault. The rupture occurred on a previously unmapped portion to the south of the known West Napa fault. The slip began at a depth of about 10 kilometers and propagated upwards and towards the north. The rupture was relatively close to Napa and correlates with the strong shaking felt in the city. The geodetic data agree with field observations of surface rupture and with seismic data. The geodetic data further shows that stresses on other faults in the Bay Area are both increased and relaxed, suggesting that the South Napa Earthquake may encourage some faults to slip while discouraging others. The quality and rapid accessibility of the geodetic data confirms its utility for global earthquake response where earthquakes of a similar size may be significantly more destructive. W. D. Barnhart, J. R. Murray, J. L. Svarc, B. A. Brooks, S.-H. Yun, E. J. 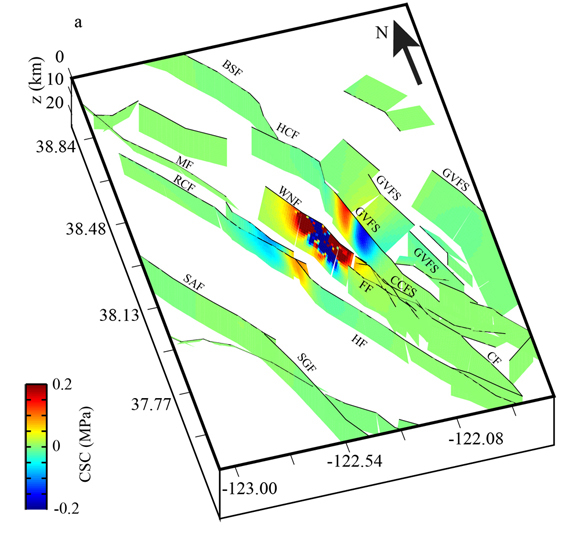 Fielding, S. V. Samsonov and P. Milillo (2015), Geodetic Constraints on the 2014 M 6.0 South Napa Earthquake, Seismol. Res. Lett., 86, p335-343 doi:10.1785/0220140210.